PRODUCT: FPJ140 2SF fire rated portal SECTOR: Data Centres CLIENT: VIRTUS LOCATION: London VIRTUS is the UK's fastest growing data centre operator with excellent financial backing, who over the last 5 years has built a track record of building and operating high quality, state of the art, resilient data centres for clients ranging from financial institutions, to cloud providers and other public and private sector enterprises. LONDON2 is VIRTUS’ flagship data centre in London, designed to meet the growing demand for scalable, reliable, on-demand colocation services. 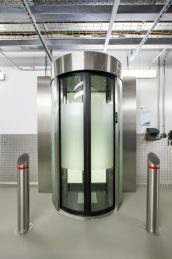 VIRTUS LONDON2 is a highly secure site and operate six layers of physical security including perimeter fencing with intruder protection, electronic biometric access control, CCTV (external and internal), restricted pass code access, and man and vehicle traps. VIRTUS also provides customers with the ability to tailor their solution within the data centres for enhanced security levels as required. In 2015 VIRTUS secured a contract with a global organisation who required a robust and secure environment for their IT deployment. The industry vertical in which they operate demands compliance across a range of international security and operational standards to ensure the integrity of its' own and customer data, and to meet regulatory requirements across the world. 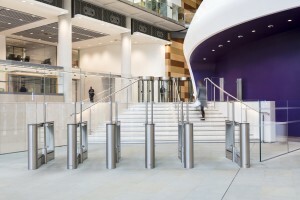 The customer required full traceability of personnel in and out of their data hall at LONDON2, with the ability to prevent more than one person from entering at a time, and to ensure no equipment is removed from the data hall without permission. 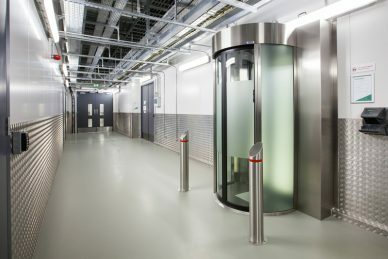 VIRTUS data halls benefit from state of the art fire detection and suppression systems so any additional entrance points to the data hall also had to maintain the integrity of the fire rated walls, whilst not reducing the operational technical space within the data hall. Finally the solution also needed to deliver privacy options to the customer, where the interior of the data hall could not be viewed from the exterior. Meesons are a supplier to VIRTUS across its Data Centre portfolio, so were the first port of call for anti-tailgating product solutions. 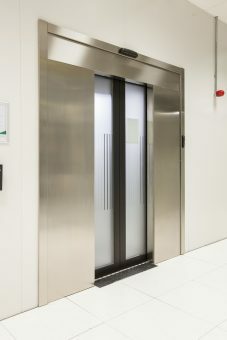 Based upon the customers requirements, Meesons proposed the FPJ140 2SF fire rated portal. The FPJ140 2SF portal was able to integrate with the building's access control system, to allow the tracking of users in and out of the data hall. The portals anti-tailgating sensors prevent more than one user entering the data hall at a time. 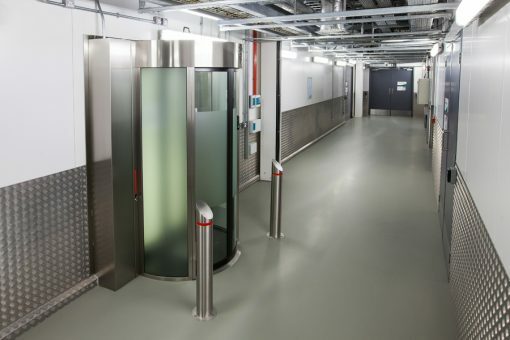 To ensure that equipment couldn’t be removed from the data hall without approval, Meesons advised on the installation of a 2 zone pressure sensing mat to further enhance security and increase the sensitivity of the user detection. The customer wanted to preserve operational space and maintain the integrity of the fire wall. Meesons proposed the FPJ140 2SF due to its compact design and fire rated approval. 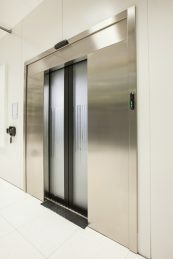 The FPJ140 2SF has been certified to EI60 and is fire resistant on the flat side for up to 60 minutes. Privacy was also a key requirement when choosing the entrance solutions. Meesons were able to provide detailed drawings which allowed for specialist contractors to fit a frosted finish on the glass panels, preventing the interior of the data hall being viewed from the exterior. Meesons worked closely with VIRTUS throughout the project to provide a solution that met the needs of the customer and also compliments the aesthetic look of the data centre.